Does your puppy or older dog have trouble gaining traction on your stairs? Do your pets slip as they climb up or down the steps? Do they slide as they race around the corner? Do you need to improve the safety of the stairs for yourself? Puppy Treads are the perfect solution! Puppy Treads are designed to prevent slips and falls. They are a non-slip solution for you and your pets. These traction enhancing strips are made from a soft vinyl material and are translucent so the natural beauty of your floor/stairs shines through. 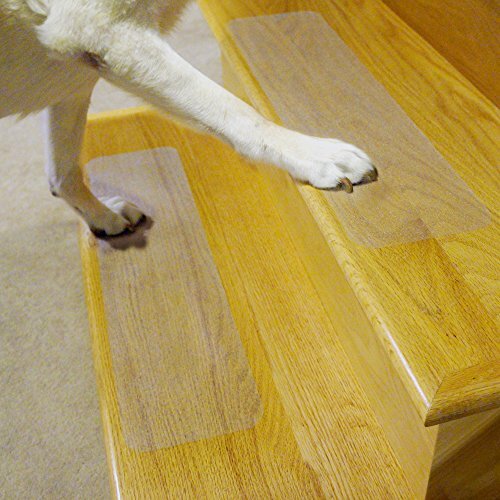 These treads are non-abrasive so they are gentle on paws and bare feet, and are self-adhesive making them easy to install- just peel and stick (installation instructions). Puppy Treads are perfect anywhere indoors because they work on tile, wood, laminate, ceramic, concrete, or anywhere else your pets or family may need added grip (do not apply on grout). If you have any questions about this product by Puppy Treads, contact us by completing and submitting the form below. If you are looking for a specif part number, please include it with your message.